The Nitro Poison Women’s Bindings were really fun to ride. The highback is one of the most comfortable and responsive high backs I have ridden. It is a hard-charging binding with all the bells and whistles you could ask for, very responsive, and also very damp. 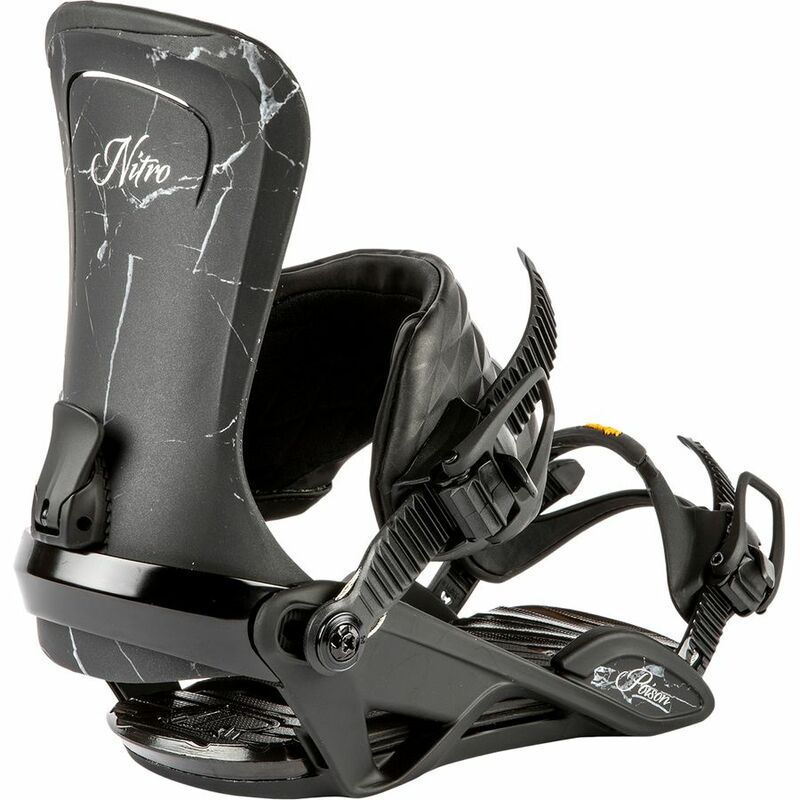 The Poison bindings come with a 3-degree canted footbed, a very comfortable footbed with Nitro‘s duel air dampening system, and one amazing highback. I only got a few runs on these due to it being demo days but would have loved to be able to give them a full extended demo to fully test them out. But they would be great bindings for the rider who isn’t looking to cut corners on their gear. I love the amount of tech these bindings have. I think they would make a great all mountain binding as well as a freestyle option. They are very responsive but you are also able to tweak them around. Highback Flex: I felt it was medium, but the highbacks also have great support. So you can tweak them around but you aren’t sacrificing stability or performance either. Boot Adjustability: Easy tool-less adjustments and the toe strap fits really well over the toe of the boot. I also love that the heel cup doesn’t pinch the back of the boot. 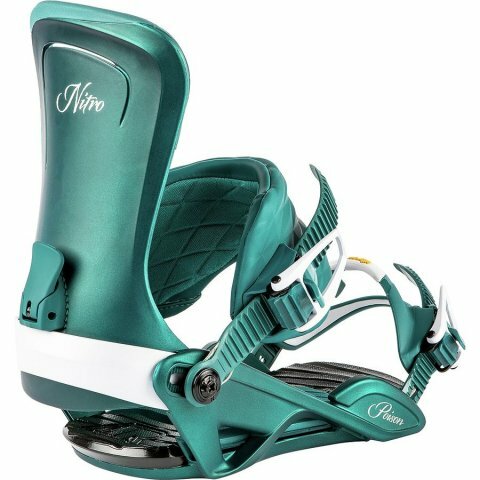 Stance Width Adjustability: Nitro has an angle lock-in system that takes a little to get used to, but it is supposed to help you from losing your angles while you are adjusting the bindings. Comfort: Very comfortable! The Footbed is amazing and damp, also canted which is good for knee, foot, and hip fatigue. And the highback is one of the most comfortable highbacks I have tried. Boot Support: The ankle strap has a very nice flex to it but it also gives the boot great support when flexed and springs back into place after. The toe strap fits great over the toe and doesn’t move at all. Turn Initiation: Easy and responsive to turn. Buttering: The Poison bindings are flexible enough to butter around, they aren’t a squishy park binding but you can definitely tweak things out without thinking twice. Ratchet System: Great rachet system, didn’t have any problems. They felt smooth on and off. There are also cables that run through the straps for added strength, which I thought was a nice touch. Shock Absorption: Awesome shock absorption, I loved Nitro‘s footbeds. We try to get as many images of the Nitro Poison, but forgive us if they're not all there.